It contains a tides indicator and the most accurate 3D moon phase in the world ever incorporated in a mechanical watch. MovementCVDK7383, automatic winding, 35 jewels, twin barrel, power-reserve; 96 hour max., complication; CVDK Real Moon Tides module. FunctionsHours, minutes, complication; Tides indicator, 3D moon phase; the watch is equipped with the most accurate 3D moon phase in the world. CaseHigh quality steel, ø 40 mm, sapphire crystal, sapphire crystal case-back. BuckleLogo engraved steel folding clasp. The CVDK Real Moon series, known for the Real Moon Joure and the Real Moon 1980, is extended with a new unique masterpiece, the CVDK Real Moon Tides. Next to a rotating miniature moon it carries a complication showing you the sea level tides in a way that has never been seen in a mechanical watch before. Tides are the rise and fall of sea levels caused by the combined effects of gravitational forces exerted by the Moon, Sun, and rotation of the Earth. There are multiple types of sea tides. In most locations you will find the ‘principal lunar semi-diurnal’ sea tide. Its period for one rise and fall of the sea level is about 12 hours, 25 minutes and 14 seconds. Waves move up and down in a special window to make this beautiful phenomenon visible. At the 6 o’clock position our unique rotating 3-dimensional real moon - indicating the true moon phase - is shown. The moon orbits around the earth every 29,530588853 days. Our hand-made 3D miniature moon indicates the moon phase so accurately that it deviates only one day in 11,000 years. 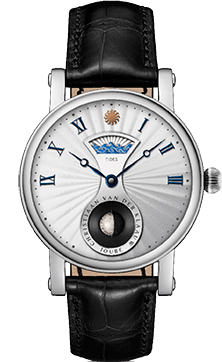 It is the most accurate 3D moon phase in the world ever incorporated in a mechanical watch. 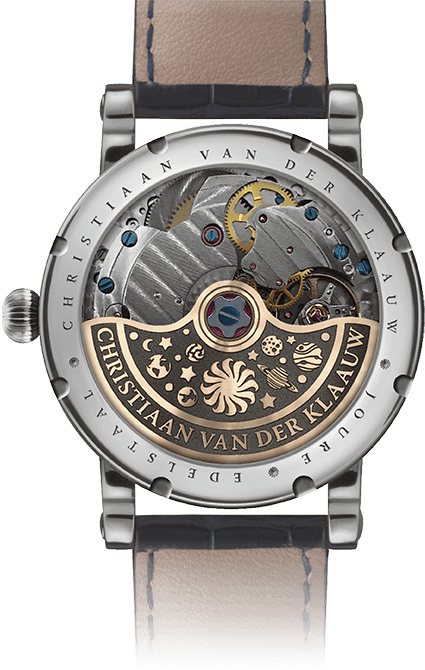 The rotor is engraved with planets, stars and the ‘Sun with 12 Claws’, the logo of Christiaan van der Klaauw. The atelier produces only a limited number of watches every year. In this way, the artists of Christiaan van der Klaauw Astronomical Watches can give every watch the attention it deserves. This attention is reflected in the beauty and quality of the watch. All watches are made by hand and subjected to countless quality tests. 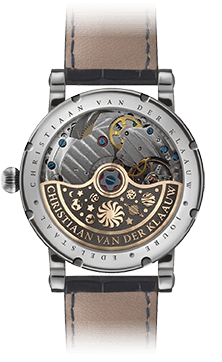 Christiaan van der Klaauw are therefore so convinced of the quality of their products, that they give a three-year warranty on the movement and the case. 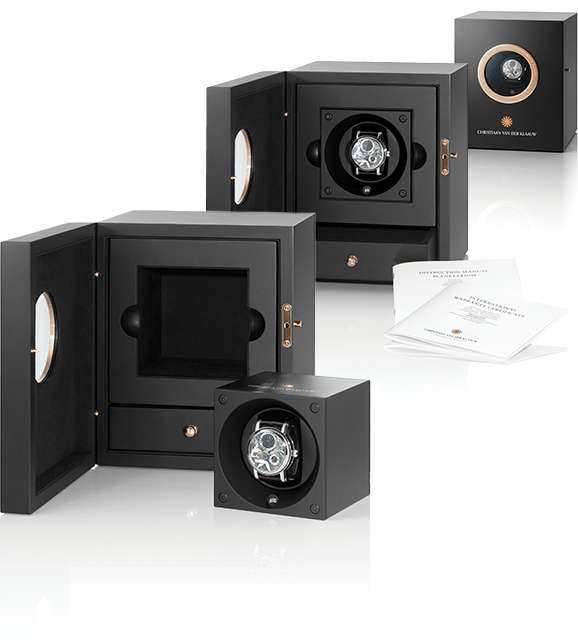 All Christiaan van der Klaauw watches are delivered in an exclusive luxurious watch box. For the Collection of the Astronomical Masterpieces the watch box is also fitted with a Swiss Kubik winder. This winder, which can be removed from the box, will ensure that your astronomical complication stays accurate.